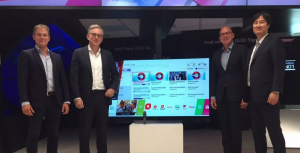 Pay TV operator M7 Group has struck a deal with LG Electronics to integrate its M7 TV app into LG’s webOS-based TVs. The M7 TV app enables users of web-OS based LG TVs to gain access to linear and non-linear TV content in HD through a central user interface and without the need of a set-top box. The app offers features including live restart, pause TV, access to media libraries and digital services such as cloud recording and an EPG. The M7 TV app will be available on all LG’s TVs starting from 2015 webOS 3.0 models. M7 will also provide access to these services via an app on mobile devices, enabling an integrated viewing experience when switching between the various screens. The TV app collaboration between M7 and LG will start in Germany, where M7 recently launched Diveo as a new TV consumer brand, targeting roughly 18 million satellite TV households, complementing the linear TV offering with a wide range of interactive and multiscreen features. Cooperation in other M7 markets will follow shortly and will include various co-marketing activities. “We are delighted with the cooperation with such an experienced, innovative and market leading player like LG, recognizing the potential of the integrated M7 smart TV application at this early stage. With the M7 CI+ module integrated in the TV set, LG TV users will benefit from an even wider range of exciting TV viewing functions,” said Hans Troelstra, CEO of M7 Group.